Yesterday we went to Bièvres, a small “country” village south of Paris. It is famous for being the hometown of Nicephore Niepce, who invented Photography in 1824. Thank you, Nicephore! (Boy! I like that first name, I wish I’d named my son after him). In Bièvres, you will find his museum and the world’s oldest photo lab. A new and bigger museum will soon be built. But we didn’t go there in order to visit the museum. Instead, I benefited from the myriad vintage cameras on display (like these old Nikkormat camera per below) in order to buy a … fixed focal 35mm f:2 Nikkor O lens! 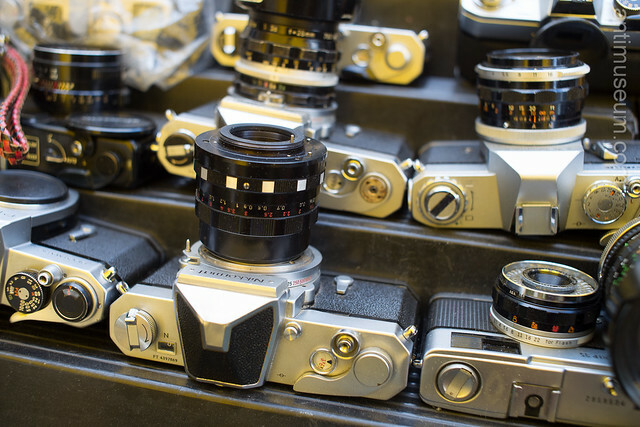 In Bièvres, you will also find the yearly second-hand market for photographic equipment. This was my first shot with the “new” 35mm lens while I tried it before buying. The lens in question, taken with another beauty, the 105mm f:2.8 Nikon macro lens. 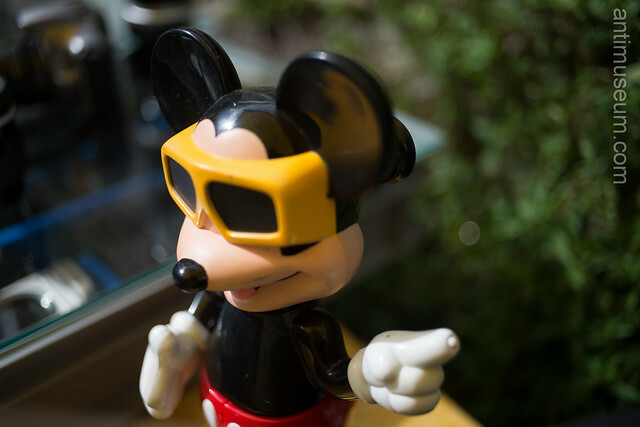 From left to right (f:2 too blurry and too small DOF, I lose some of the details – f:4 perfect shot with maximum crispiness, 2 stops above maximum aperture and a beautiful bokeh at that), I shot this Mickey mouse for a test of the 1980s [following Joel Burt’s comment per below, I have to add that this lens is from the 1960s rather; evidence of that can be found here, the lens was manufactured from 1962 onwards. It is therefore, almost my age!] manual lens. It worked beautifully, the image is crisp and you can tell the lenses are beautifully crafted and still intact. The price is … well unbeatable. I got this beauty for €130 for I bought it while the salesman was packing his stuff; it was worth €170 on the opening. The only thing I miss is the original metal lens hood, so it will cost me an extra 10-15€ (just have a look at the prices for these ugly plastic things!). I am definitely in favour of fixed lens photography. Any time I used my fixed lenses I am very happy with the result: images tend to be crispier (look at the macro shot of the lens above, it’s a beautiful shot too! and no artificial lighting at all was needed). 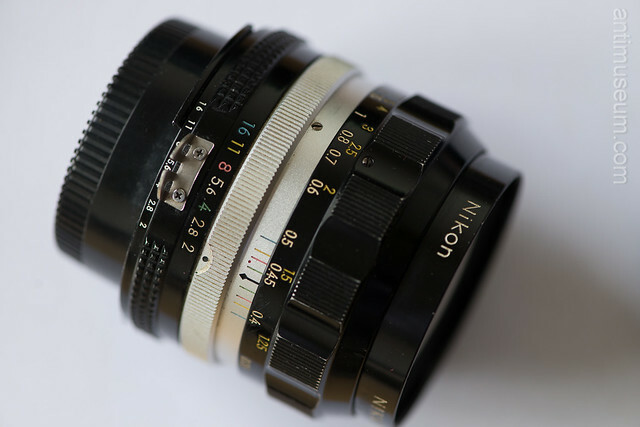 I am not the only one to like fixed focal lenses and recommend these old second-hand beauties. They are all made of metal, beautifully crafted, they force you to engage with your subjects a lot more than zoom lenses. All in all, I find that I spend more time thinking about my shots and this is beneficial too. OK! You will not benefit from the autofocus; but I always shoot in manual mode anyway, and I hate what the autofocus is doing because it seems to be living a life of its own; hence my using it in “single” mode only). 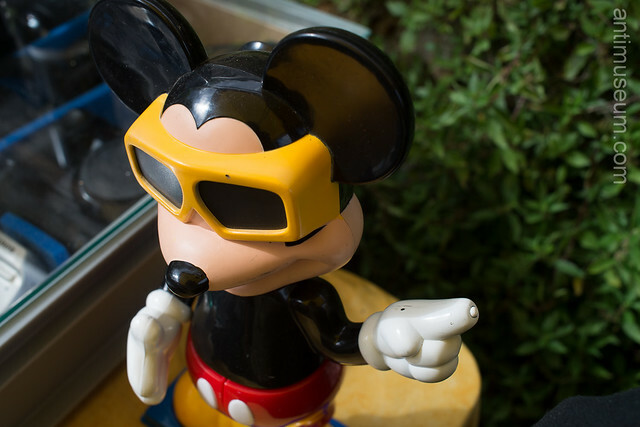 Here is Mickey mouse in a larger format so that you can admire the details, and namely, that little black dent in the yellow glasses. I am also thankful to my friend Olivier Saint Léger for recommending that lens to me. 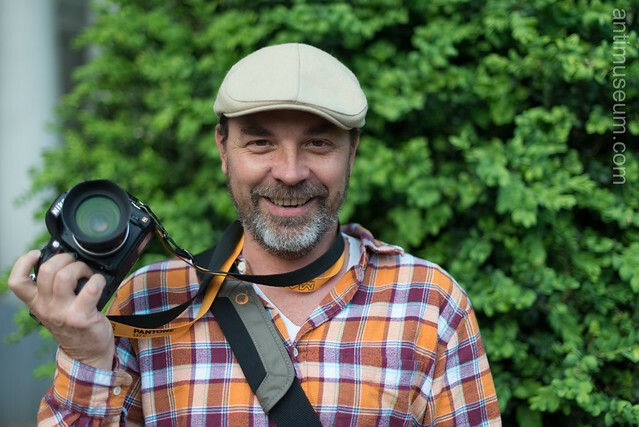 Olivier is pictured above in a shot taken with another fixed lens marvel: the Nikon 50mm f1:4 fixed focal lens. Olivier and I have “founded” the Paris Photo ‘non-club’ in order to organise photo outings in Paris. There will be one next Wednesday, join us if you can! Hi there, that lens is from the 60’s not the 80’s. It has been converted to ai with a factory kit. The “o” version is the earlier single coated version and it is prized for portraits and b+w photography. Thank you so much Joel for those precisions, this is very kind. I had come to exactly the same conclusions, as I find the lens particularly good for portraits and black and white. Thanks for stopping by. feeble defenses” [they encounter]. Johnson Bros such since the dinner set a murderer in first impression and also the wrong set can ruin the feeling beyond repair. fantastic issues altogether, youu just gained a new reader.